Residents seeking admission to our facility must apply through the Community Care Access Centre (CCAC). Please contact CCAC at (905) 639-5228 to obtain more information about the eligibility criteria, including the admission process. Our home is designed to provide the residents with full amenities including dining room, lounge areas, as well as leisure and recreations areas. We offer private and basic types of accommodations. While the accommodation of your choice may not always be available upon admission, it will be offered as soon as such vacancy occurs. The rooms are bright and spacious with large windows. Each room is furnished with a bed, bedside unit, built-in closets, emergency call system and provides for internet, telephone and cable services. We encourage residents and families to bring personal furnishings, such as family pictures, knickknacks, etc., to maintain a familiar and home like atmosphere. 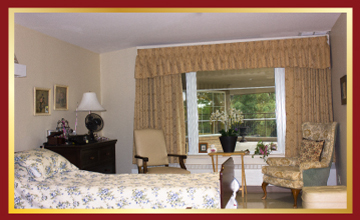 Our home is licensed and regulated by the Ministry of Health and Long Term Care. The Ministry determines and regulates the monthly rates for preferred and basic types of accommodations. Residents may be eligible for reduced co-payment rates for basic types of rooms. 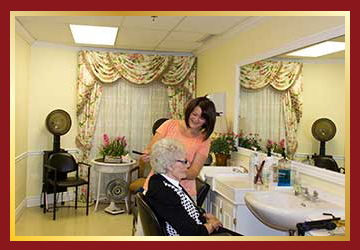 The residents have the opportunity to enjoy on-site beauty salon and barber services at scheduled times during the week. Housekeeping services are available at no cost to the resident and are designed to provide a safe, comfortable, sanitary and functional environment for the residents, staff and visitors. Laundry services are provided by the Home at no cost to the resident, including labeling, washing and drying of personal clothing as well as provision of clean linen, wash cloths and towels.